Devoted Creations Detour Black Bronzer Tanning Lotion - 12.25 oz. Dark color, redefined! 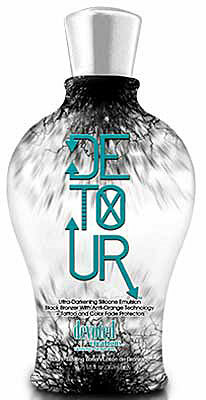 Detour’s black, body-bronzing formula will help you shatter your tanning plateau! Anti-orange ingredients plus potent skin firming agents ensure you develop the darkest bronze color while aiding in perfecting pesky skin imperfections. If you’re tanning routine is stuck in a rut, and you are ready to break barriers- take a Detour! Plateau breaking DHA, Natural & Cosmetic Bronzers deliver a deep, dark, delayed and immediate bronzed result. Blue Tansy™ – Flower extract that contains calming and healing properties while using blue hues to counteract orange tones in the skin to provide the most natural color possible. Tiger Grass Color-correcting ingredient that reduces redness and helps protect skin from environmental stress and blemishes. Japanese Rose™ – Refines pore size while boosting collagen production and reducing excess oil. Charcoal Extract – Absorbs excess oil, detoxifies, and reduces inflammation while aiding in improving acne prone skin. Advanced Matrixyl Synthe 6™ – Powerful anti-aging peptide that reduces the appearance of fine lines and wrinkles for long lasting results. Body Fit™ – Reduces the appearance of cellulite and restores firmness. Melatime™ - Stimulates melanin activity for enhanced pigmentation. Blended with multiple accelerators that work to target melanin production and achieve fast, darktanning results. Save 68% Millennium THE BEST Instant Bronzer DHA Free - 13.5 oz. Save 52% COCONUT CABANA by Tan Asz U Advanced 200X Bronzer -13.5 oz. Save 54% BLACK COCOA COLADA 200 X Bronzer by Brown Sugar - 13.5 oz.